1169 And Counting.....: THE 'MOLLY MAGUIRES' AND 'THE DAY OF THE ROPE'. ...an award-nominated Irish blog on Irish history and Irish politics-from today and yesterday:all 32 Counties ! THE 'MOLLY MAGUIRES' AND 'THE DAY OF THE ROPE'. 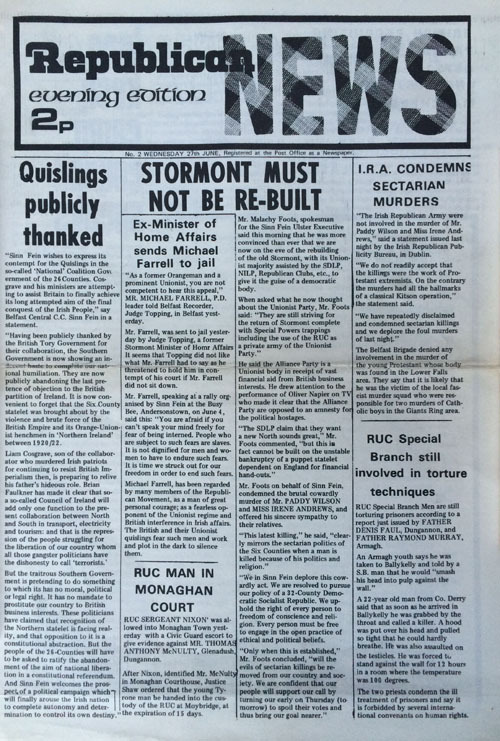 ON THIS DATE (21ST JUNE) 44 YEARS AGO : "FASCIST MURDER SQUAD" STRIKE AGAIN. "The Belfast Brigade denied any involvement in the murder of the young protestant whose body was found in the Lower Falls area. They say that it is likely that he was the victim of the local fascist murder squad who were responsible for two murders of catholic boys in the Giants Ring area" - from the 'Republican News' newspaper, June 1973. Of all the bombings, atrocities, tortures and killings that have unfortunately being visited and imposed on this country by Westminster due to their unwanted military and political presence here, the shooting dead of David Walker is one of the worst : this special needs sixteen-year-old boy was lifted off the street by the 'Official IRA', apparently as a 'dare', at about 8.30am on Thursday, 21st June 1973 - 44 years ago on this date - as he was working in his job. He was found about three hours later on the Falls Road with gunshot wounds to his head and chest. He died a few minutes after he had been found. It may well be forty-four years since that barbarous act, but the political conditions for deeds like it are still in place - and it would still suit those in power in Westminster to have 'the wild Irish' killing themselves, allowing the British - the 'man in Leeson Street' - to continue to present themselves as being in Ireland 'to keep the warring factions apart'. 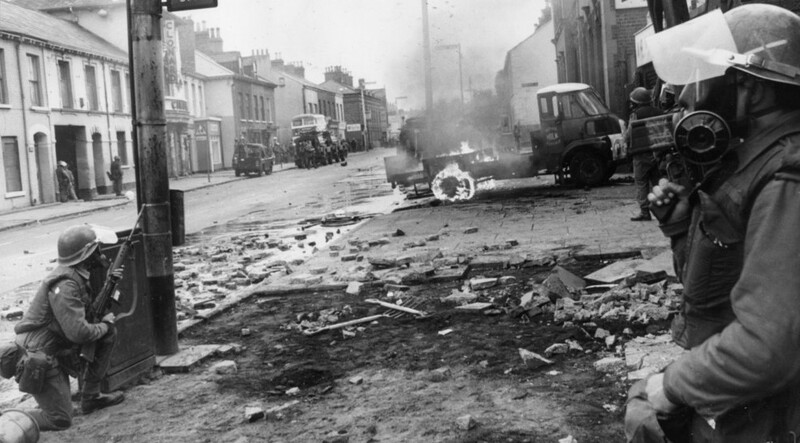 The only workable solution is that of a British political and military withdrawal from Ireland. By prisoners from E1 Landing, Portlaoise Prison, 1999. Grateful thanks to the following for their help, support, assistance and encouragement, and all those who helped with the typing and word processing over the past few months. Many thanks to Cian Sharkhin, the editor of the book, Mr Bill Donoghue, Governor, Portlaoise, Mr Seán Wynne, supervising teacher, the education unit in Portlaoise Prison and the education staff, especially Zack, Helena and Jane. Education officers Bill Carroll and Dave McDonald, Rita Kelly, writer, print unit, Arbour Hill. First Print : November 1999, reprinted March 2000, illustrations by D O'Hare, Zack and Natasha. Photograph selection : Eamonn Kelly and Harry Melia. and the way it might clatter? about the fear and the smell? and the dirty old lice? and turn a blind eye? I wonder why the bard has to lie? and maybe earn extra pay. is why he doesn't give away a lot. what he sings is for show. 'cause his song is good. and through the bard they're not that hard. Since the Irish and the English see the world from completely different planes of being, it is of interest to examine how, after all this conflict, one side views the other : "Fundamentally they do not very much respect us, we carry in our bearing, in our eager efforts to please, too much of the humility of the one time native. It is there in our sudden gushes of talk, in our sideways glances, in our constant lack of urbanity," as Elizabeth Bowen said, we are "florid, vain, quick to guilt and sentimentality." We disregard things important in their civilisation ; like pride in their army and navy. We lack periods of silence, good breeding and restraint. We speak a rapid, almost foreign, type of English, like Indians - "a brogue", they call it. Unlike the Scots and the Welsh, we have constantly wanted to stay out of their hegemony. We have nearly always been regarded as "a damned nuisance". We exasperate them by our sense of history ; in no other place has the population been in such constant rebellion against their impartial benevolent rule, and we will not let them forget it. Duplicity, fear and evasion are all at work in our mutual relations - the glissades of unsettled historical conflict and of unspeakable present happenings cause undercurrents at the most staid and informal of our encounters. They find us unpredictable, we find them stiff. 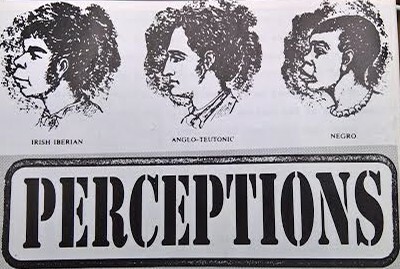 We can offend them by our most commonplace utterances on, say, World War II or the Malvinas War and they offend us likewise, since they do not understand or practise our unspoken, unacknowledged but very real concept of 'face'... (MORE LATER). ON THIS DATE (21ST JUNE) 140 YEARS AGO : 'THE DAY OF THE ROPE'. On what became known as 'Black Thursday' (21st June, 1877), ten coal miners were hanged until dead in eastern Pennsylvania ; all ten had been born in Ireland but were forced to leave because of An Gorta Mór. 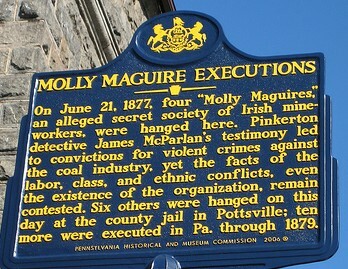 It was claimed that they, and others, were involved in 'organised retributions' against corrupt and unfair employers and other members of the establishment, and operated as such under the name 'Molly Maguires' (Molly Maguire had become famous in Ireland [or 'infamous', as the 'landlord' class described her] for refusing to bow down or bend the knee to them). The workers had been arrested for their alleged part in several killings and, despite much doubt cast over the 'evidence' used against them, they were convicted and sentenced to death. The court case was widely seen as employers drawing 'a line in the sand' in regards to what they considered to be 'uppity' workers looking for better wages and conditions, and an excuse for the establishment to vent its anti-labour and anti-Irish prejudice - 'The first trials began in January 1876. They involved 10 men accused of murder and were held in Mauch Chunk (an Indian name meaning 'Bear Mountain') and Pottsville. A vast army of media descended on the small towns where they wrote dispatches that were uniformly pro-prosecution. The key witness for the prosecution was yet another Irishman, James McParlan. Back in the early 1870's, when Gowen had hired the Pinkerton Detective Agency to spy on his workers, McParlan had gone under cover to infiltrate the Mollies and gather evidence. And gather he did — or at least he claimed he did during the trials. On the stand he painted a vivid picture of 'Molly Maguire' secrecy, conspiracy and murder. With Irish catholics and miners excluded from the juries, the verdicts were a foregone conclusion. 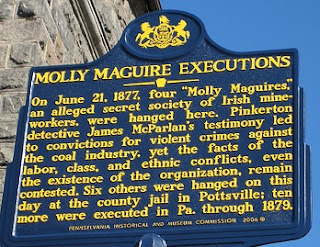 The scene in Pottsville, Pennsylvania, on Thursday, 21st June 1877 - 140 years ago, on this date - as alleged members of the 'Molly Maguires' were taken to the scaffold. All 10 were convicted and sentenced to hang. 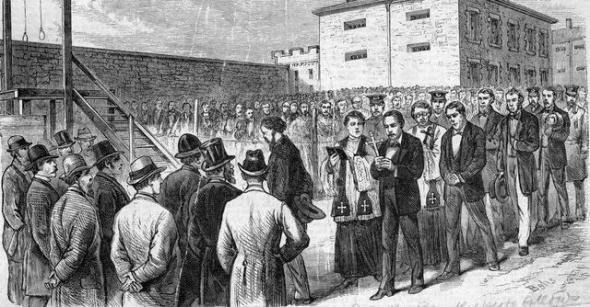 No doubt seeking to send the most powerful message to the region's mining communities, authorities arranged to stage the executions on the same day — June 21st, 1877 – in two locations. Alexander Campbell, Michael Doyle, Edward Kelly, and John Donahue were hanged in Mauch Chuck (where the four men "all swung together") , while James Boyle, Hugh McGehan, James Carroll, James Roarity, Thomas Duffy, and Thomas Munley met a similar fate in Pottsville (where all six "swung two-by-two"). Although the hangings took place behind prison walls, they were nonetheless major spectacles that drew huge crowds and generated international news coverage..' (from here). It was reported that there was "..screams and sobbing as husbands and fathers were bid goodbye.." and that "..James Boyle carried a blood-red rose and Hugh McGehan wore two roses in his lapel (as) James Carroll and James Roarity declared their innocence from the scaffold.."
Over the following two years, ten more alleged members of the 'Molly Maguires' were hanged, including Thomas P. Fisher (on the 28th March 1878) and James McDonnell and Charlie Sharp (on the 14th January 1879). In 1979, the state of Pennsylvania pardoned one of the men, John 'Black Jack' Kehoe, after an investigation by its 'Board of Pardons' at the behest of one of his descendants (incidentally, Seán Connery played the part of John Kehoe in the film 'The Molly Maguires') and, on the 5th December 2005, the Pennsylvania State House of Representatives passed a resolution recognising the lack of due process for several of the men. You'll never see the likes of them again. Then drown their tears with a jar. Who'll dare to push them around. By Jim McCann (Jean's son). For Alex Crowe, RIP - "No Probablum". 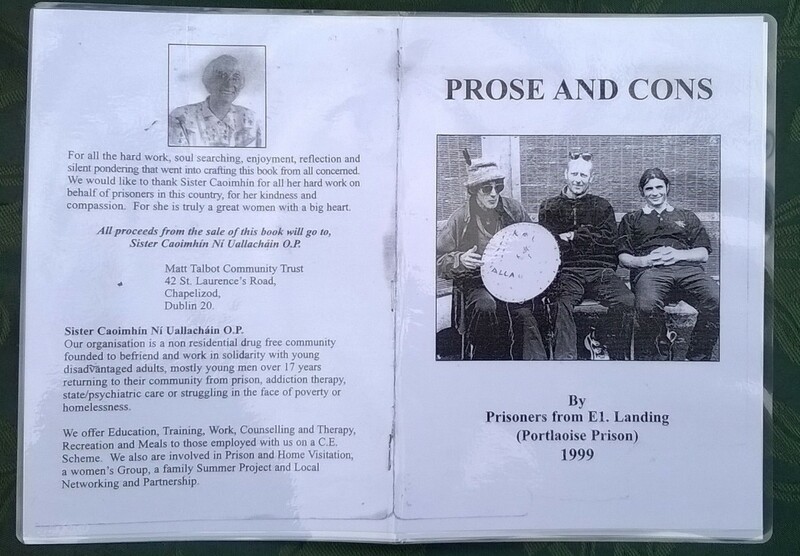 Glandore Publishing, 1999. Biographical Note : Jim McCann is a community worker from the Upper Springfield area in West Belfast. Although born in the Short Strand, he was reared in the Loney area of the Falls Road. He comes from a large family (average weight about 22 stone!). He works with Tús Nua (a support group for republican ex-prisoners in the Upper Springfield), part of the Upper Springfield Development Trust. He is also a committee member of the 'Frank Cahill Resource Centre', one of the founders of 'Bunscoil an tSléibhe Dhuibh', the local Irish language primary school and Naiscoil Bharr A'Chluanaí, one of the local Irish language nursery schools. 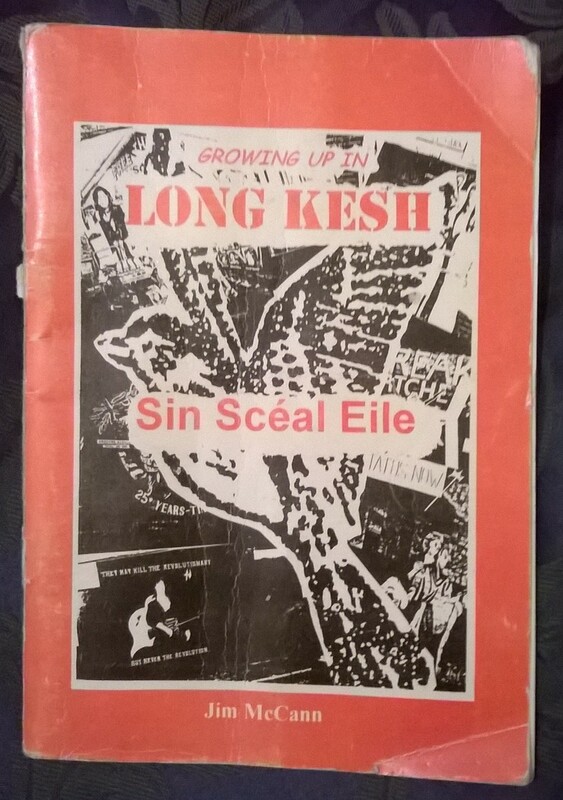 His first publication last year by Glandore was 'And the Gates Flew Open : the Burning of Long Kesh'. He hopes to retire on the profits of his books. Fat chance! "HEY, DO YOU WANT ANY DRUGS...?". We carried the containers into the canteen as he drove off and I gave him a nod to indicate my thanks for the bounty I was soon to receive. The bunch of scallions was enormous - there was plenty for everyone, and tons for me. My colleagues on the Canteen Staff started dishing out the suppers - we had earlier decided to keep the scallions for Sunday dinner. Some big mouth in the Cage let the cat out of the bag that we had scallions, and the tobacco tins were flying into Cage 11 from all directions, all carrying the same message : 'Can we have some scallions?' They tried every device to get their hands on our windfall but to no avail. Old favours were called in, family ties and threats of physical violence. I personally was offered a huge sirloin steak for a plate of Champ - but you could pick up sirloin almost anywhere, but not so with scallions. I offered to get some scallions for them the following week but that offer was thrown back in my face : 'We want Champ and we want it NOW!' They tried to entice us with cigarettes, tobacco, poteen and places in their tunnels. I know for a fact that if these men had been outside and their mothers had put Champ down in front of them for dinner, they would have said no to it and then wrecked the house. Champ in our area was very much an end of week supper just before the weekend when the housekeeping money was low... (MORE LATER). Republican Sinn Féin , Dublin (Facebook page).